Windows Server 2012 - Can I change the items displayed in the "Template" field of the printer directory when using a universal / basic driver? - New and Fresh Private + Public Proxies Lists Everyday! Windows Server 2012 – Can I change the items displayed in the "Template" field of the printer directory when using a universal / basic driver? 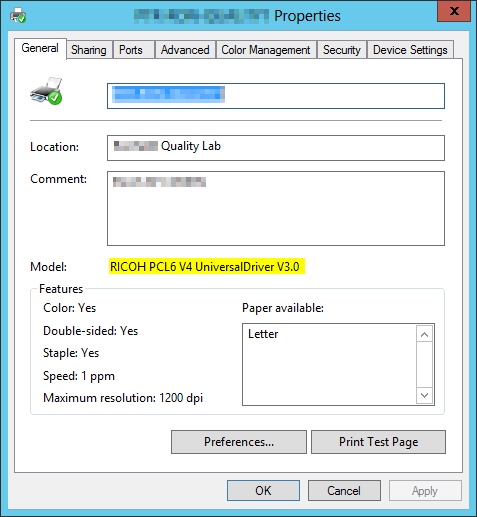 I have some printers on a Server 2012 print server that use "universal" drivers from the manufacturer. Is there a way to change this model field to this real model name, without changing the driver? I would prefer users to see the model name, if possible.